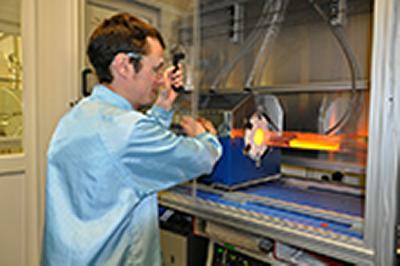 The University of Southampton is to share in ?20 million of funding to advance the UK's manufacturing capability. It will lead two of ten new research projects announced today (19 December) by the Engineering and Physical Sciences Research Council (EPSRC). The Chalcogenide Advanced Manufacturing partnership (ChAMP) is a partnership between the University’s Optoelectronics Research Centre (ORC) and the Universities of Exeter, Oxford, Cambridge and Heriot-Watt, along with 15 industrial partners. Southampton will receive £3.1 million to revolutionise the manufacture and use of specialised glass, called chalcogenides, in a range of products from optical fibre and infrared lenses to electronic devices, including logic and memory. The University’s Composite Material Facility, unique to the UK, will also help to develop and manufacture radically new and advanced materials. Professor Dan Hewak who is leading the group says: “We are fortunate to have several world-leading scientists join us in this partnership to address the manufacturing research challenges in developing applications, production technologies and future processes that incorporate these advanced functional materials. The other project ‘Novel manufacturing methods for functional electronic textiles’ will receive £2.8 million to develop novel manufacturing methods for wearable technology. It will be led by Professor Steve Beeby from Electronics and Computer Science and also involves Nottingham Trent University and a number of industry partners. ChAMP involves the following industrial partners: Fibrecore; Glass Technology Services; Lenton; M-Squared Lasers; Samsung Electronics; Plastic Logic; SEPNET; Oxford Instruments; Gooch & Housgo; National Instruments Corp (UK); Chell Instruments; NPL; Ilika; Qioptiq; Seagate technology; DSTL.